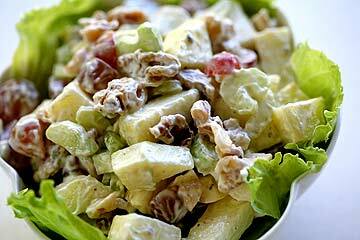 I love Waldorf salad--one because it tastes so good: crisp and summery. Two because it is so variable. You can do so much with a Waldorf salad. This recipe is my favorite and is the one I usually make. Everyone always loves it, and everyone is always surprised by the ingredients. Usually, Waldorf salad is made of apples, walnuts, and celery mixed in a mayonnaise dressing and usually it is served on a bed of lettuce or spinach or in a croissant. This version feels more like a substantial meal due to the addition of cubed cheese (I think once I even added some chicken). It also has grapes and dates in it and has a yogurt-based dressing. Step 1) Get some pecans or walnuts toasting (so worth it to take the time to toast them). Step 2) Dice 3 tart apples and toss them in some lemon juice. Step 3) Add some chopped dates and cubed cheese. Step 4) Add grapes (halved or whole), minced celery, and the toasted nuts (hopefully they are cool, but if not, I usually just add them anyway and everything turns out just fine). Step 5) Add the dressing. Like I mentioned earlier, usually it's mayonnaise. In this dressing it's mostly yogurt with some mayo and orange juice. Yum! 1. Combine the salad ingredients. 2. Whisk together the dressing ingredients. 3. Combine everything and mix well. Note: Sometimes I add orange slices or shredded carrot. Note: This recipe is from the Moosewood Cookbook by Mollie Katzen. I love this but can't eat cheese, so after a great deal of thought I decided I'd add avocados in place of the cheese. If the avocado is still firm-ripe I think it would work. What do you think? I think I'd actually just omit the cheese. I'm not sure, but I think that even firm-ripe avacados might get too mushed and then any leftovers would likely get an unsitely brownish color. yuck! Maybe you're right, but I've actually made kale and avocado salads from one I had at Whole Foods in Austin and I soak the avocado in lemon juice so it doesn't turn brown. Not much ever gets left over because avocado the honey, lemon avocado is to die for. I think I'll try it with a few other tweaks, maybe just make enough so it won't get leftover. Thanks Jamie, maybe next week for the kale salad. I'll let you know how it turns out. First, I have to get some grapes. This look so good! This recipe would be a perfect addition to my Cast Party Wednesday Link Party. Would you come over and share some of your recipes with us? Your Waldorf Salad looks really really good.I haven't tried making one at home.Thank you for sharing. We just love a good Waldorf Salad and your recipe looks delicious. Thank you so much for sharing with Full Plate Thursday and hope to see you next week. Have a great week end! You are featured on Full Plate Thursday! You are welcome to pick up your Red Plate. Hope you are having a great week!